In the conservation of art, the impulse “to do” is the most dangerous of all. There are so many ways in which picture restorers can, through misreading or misunderstanding, injure art. Unfortunately, there are also many ways of promoting injuries as triumphs. Worst-case injuries can be spun as dramatic “discoveries” and “recoveries”. With the Sistine Chapel ceiling restoration – perhaps, an all-time worst case – the last stages of Michelangelo’s sculptural painting were washed away with oven-cleaner-like chemically-laced thixotropic pastes and copious applications of rinse-water (see Fig. 1 and our earlier post). To sanction the unexpected and unprecedented changes, a “New Michelangelo” of art history-changing, colouristic brilliance was invoked. 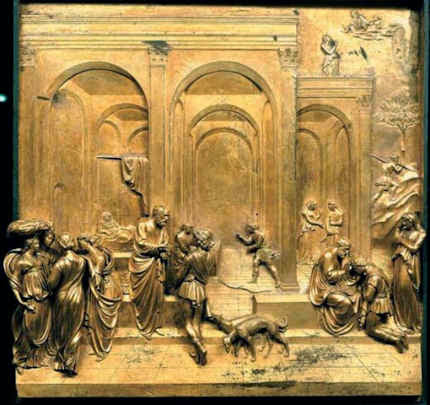 The surprise outcome was presented, post hoc, as having demolished the “Darkness Fallacy” and the “Sculptural Fallacy” of Michelangelo’s legendary, much-copied and commented-upon work. Less technically experimental methods can also produce serious alterations during a single intervention (see Figs. 2 & 3). Not always immediately noticeable but ultimately no less invidious are the cumulative “Chinese Whispers” changes made as successive restorers undo and redo their predecessors’ work. A case in point of the latter – and of the defences that get offered – can be seen in successive treatments of the London version of Leonardo’s “Virgin of the Rocks”. The cult of unexpected and dramatic discoveries grew out of earlier (spurious) claims of scientifically underpinned restoration methodologies. “Picture surgeon” restorers mimicked the conventions and vocabularies of medicine with its “diagnoses”, “research”, “interns” and “treatments”, and ended by believing their own easel-side manners and propaganda. In truth, they have always more closely resembled cosmetic surgeons and it makes cultural sense to consider these twin spheres together. Both promise to reverse Time’s effects. With both, adverse consequences are often slow to be recognised. With human cosmetic surgery, everyone has recently learned of the horrors of industrial-grade silicone breast implants and Trout Lips. News has recently begun to emerge of the unanticipated consequences of radically invasive attempts to put the very fabric of paintings into perpetual good health. The National Gallery now concedes that its former penchant for ironing large masterpieces (like Titian’s “Bacchus and Ariadne”, Seurat’s great “Bathers”, and Sebastiano’s “The Raising of Lazarus”) onto sheets of industrially manufactured pressed-paper (Sundeala) boards has bequeathed pictures that can no longer be moved safely. Whether restorers are taking off or putting on, restorations never take place in vacuums. There is always a context that is comprised of a singular balance of forces and interests. These forces are various and competitive, being sometimes personal, sometimes professional, sometimes institutional; sometimes local, sometimes national, sometimes international; sometimes technical, sometimes philosophical; sometimes political, sometimes financial. 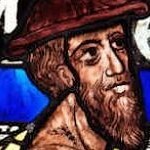 But if there are rival, inter-acting sociologies or cultures of restoration, these always find expression in the individual acts of restorers upon individual, unique and historical works of art. It is therefore incumbent on those who authorise or sanction restorations to permit/guarantee absolute transparency in restoration procedures and methodologies. In this respect the National Gallery has recently made enormous strides. Under the Gallery’s present director and its previous director, ArtWatch UK has been given full and generously helpful access to conservation and archival records. The Gallery publishes in its annual Technical Bulletins much material on its own workings in conservation. Nonetheless, some old habits die hard. The best-reported conservation activities in the bulletins tend to be in the most neutral areas – in technical analyses of materials, applications of imaging systems, and so forth. The least adequately reported activities are precisely the crucial hands-on physical interventions of restorers. Over the years, we have formed an opinion on this lacuna. There is a problem for the Gallery in fully acknowledging and showing what individual restorers do, because they do different things, each according to his own inclinations and talents. Taking the recent restoration of the “Virgin of the Rocks” as our case in point, let us first look in from “the outside” at the broader context. As we have discussed before, this was a restoration whose celebration (in what was to become a £1.5 billion exhibition) was planned before the restoration itself had even begun. As we have also previously discussed, the Gallery has proudly published its policy or “philosophy” of restoration treatments. Its handbook “Conservation of Paintings” acknowledges that pictures are now “changed primarily for aesthetic reasons” (p. 53) and (p. 45) that restorations are carried out on the “aesthetic objectives of those responsible for the cleaning”. Moreover, (p. 53) although the “different aesthetic decisions” taken by individual restorers produce results that “may look very different”, all of such different outcomes are “equally valid”, provided only that they have been carried out “safely”. These are alarming claims: in matters of aesthetic and artistic integrity, the “safety” or otherwise of the cleaning materials is a red herring: if pictures end up looking different, they are different, and these differences are material and irreversible. “Whenever possible, major restorations are intended as the hub of a wide range of research activity that sees curators, scientists and restorers working together – increasingly alongside colleagues from other institutions”. The significance of such extra-conservational purposes of restorations should not be overlooked or underestimated: much of the credit for the present historically unprecedented coralling of quite so many Leonardos in one place at one time, has been given to the international connections and diplomatic skills of Gallery staff, as seen in their increasingly close relations with other major institutions such as the Louvre. As it happens, the relationship with the Louvre is proving more problematic and embarrassing than the Gallery might have anticipated. 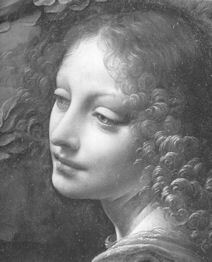 It has recently been reported that among the membership of an international advisory committee set up by the Louvre to advise on and monitor the restoration of Leonardo’s “The Virgin and Child with St Anne”, the two members who proved the most enthusiatic advocates of a more, rather than a less, radical cleaning of the painting, have been the National Gallery’s head of conservation, Larry Keith, and the curator of the current Leonardo blockbuster, Luke Syson. Leaving aside the risks of lending the hitherto unlendable Cartoon, with the restoration of the London “Virgin of the Rocks”, we had initially been somewhat reassured to have been told that this was not to be an aggressive restoration; that while it would greatly thin the varnish applied by Helmut Ruhemann in 1949, it would not entirely remove it. (Pace the Art Critics, it has never been made clear how a cleaning that ran from November 2008 to May 2009 and that had not removed all of the previously applied varnish, might somehow have disclosed an entirely autograph status throughout a picture that was variously painted and unevenly finished.) When it went back on show after its “moderate” cleaning, old anxieties flared: it was evident that, with its now violently assertive blues, the picture had not returned to its previous post-cleaning appearance in the 1950s and 1960s. For the latest detailed accounts of the restoration and for photographic records we turned to the current Technical Bulletin (No. 32). 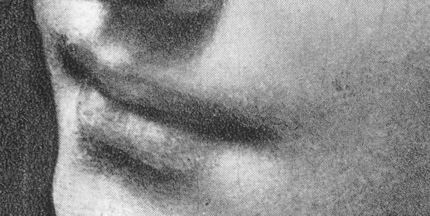 The recent redrawing and remodeling during a restoration has cast the far side of the mouth downwards and left the upper lip no longer tucking enigmatically into the cheek in the manner so frequently encountered (see photographs, right) as effectively to constitute a trademark Leonardo/Leonardo school signature. The photographic evidence raised two questions: What had been done? Why had it been done? We returned to the Technical Bulletin. No answers were to be found. There was no explanation because there was no mention or account of any change having been made to the mouth. As so often, the Bulletin’s authors favoured the general over the particular. We learnt that “The intent of the cleaning was to effect the desired aesthetic improvement through the reduction of the old varnish, not simply to remove it, and in the main a very thin remnant of that layer…remains on the picture.” This deepened the mystery: if a thin layer of Ruhemann’s 1949 varnish had remained over the face, and if this layer had not been injured during the latest cleaning, why should any features have needed changing at all? We asked the restorer, Larry Keith, if he had made any retouchings to the face of the angel. He replied that he had, but said that these had been confined to areas of damage and or abrasion. Specifically, he said that he had not introduced any new elements. This seemed at variance with the photographic record, insofar as we were in possession of it. That the mouth had changed was beyond doubt: we had record of its condition in photographs of 1938 (Fig. 5) and 1947 (Fig. 6). When Kenneth Clark’s 1938 book of details of paintings in the National Gallery was reissued in 1990 it was with new (this time, colour) photographs. We thus had a record (Figs. 5 & 6) of the angel’s face before the Second World War and, crucially, before Helmut Ruhemann’s 1948-9 restoration. We had a record of 1990 that showed the post-Ruhemann state (see Fig. 7). The mouth might have been weakened by Ruhemann (see Figs. 15 & 16) but its disposition – which had conformed to that seen in an x-ray photograph of 1947 (Fig. 19) – had survived. Ruhemann had, however, chiselled away the end of the nose so as to bring it inside the contour of the face (Figs. 5, 6 & 7), as is the case with the angel in the Louvre version (Figs. 9 & 10) but was seen not to be the case in the 1947 x-ray photograph of the London picture (Fig. 19). Keith has retained Ruhemann’s revision of the nose which had undermined (for reasons to be examined on another occasion) the coherence of the head’s perspective . Clark’s book had again been re-issued in 2008, this time with distinctly superior new, digital colour photographs (see Fig. 8). At this late date, the mouth showed no change. So when, in November 2008, Larry Keith’s restoration began, the published photograph of that year effectively constituted a pre-treatment record, and the cover photograph of the angel on the current Technical Bulletin constituted a post treatment record. In between the two, the changes to the face had occurred. (To show the changes to the mouth more clearly, the painter Gareth Hawker tonally adjusted the 1938, 2008 and 2011 photographs seen at Fig. 4 so as to bring them to some tonal parity.) In view of the dramatic change to the mouth and the absence of any signs of losses or abrasions that might have preceded the repainting, we requested photographs of the angel’s face taken immediately after cleaning (but before retouching), and after retouching. These were kindly supplied. They confirmed that the mouth had been changed by retouching (see Figs. 17 and 18) but the pre-retouching photograph gave no indication of injuries or losses that might have required treatment. We therefore asked Keith, on what basis he had made his painted changes to the mouth (and elsewhere). He did not reply. Some weeks later Luke Syson replied on Keith’s behalf, saying that as the curator of the work, he had been responsible for monitoring and advising on all aspects of the restoration and was therefore the person carrying the responsibility for answering all questions, including our own, about the restoration. Unfortunately, in this professional capacity, the curator, too, preferred to talk in the generality and to explain the restorer’s approach to the painting “as a whole”. I replied that, on the evidence of the Gallery’s two photographs, it was clear that features in the angel’s mouth which had survived both the Ruhemann cleaning and Keith’s own cleaning had been painted out. Would he explain, I asked, the thinking behind the alterations, and why changes to so sensitive and highly expressive a feature had not been discussed or acknowledged. I added that in my examination of the Gallery’s conservation dossiers I had encountered other instances of un-discussed and un-acknowledged changes made by restorers – including a major change to the Leonardo Cartoon. In replying, Syson first said that he had reviewed the photographic evidence but could see no evidence of any deviation in Keith’s retouching from the procedure that he (Syson) had previously described. This was a depressingly circular bureaucratic response. Our concern had not been over command and management procedures at the Gallery, but over actual changes to specific and crucial features of a major and unique historical painting. Syson then claimed that the photographs showed that a single small damage had been revealed in Ruhemann’s 1949 cleaning and that he had retouched it. Keith, Syson added, had removed that single retouch to a small damage, in order to retouch it himself on the evidence provided by the surrounding undamaged paint. 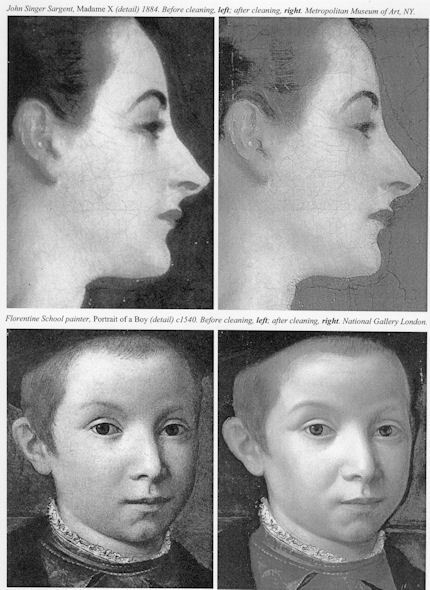 But this simply conjures a fresh mystery: how can noe restorer’s substitution of one small retouch of a single small loss by another restorer, have caused a mouth that formerly turned upwards at its extremity and tucked into a cheek, to turn downwards and cease to tuck into the cheek? However this might have happened – and clearly, something happened – where is the record of it? Between 1945 and 1994, Vermeer’s poor “Lady Seated at the Virginal” received no fewer than nine bouts of “treatment” – including being lined twice within three years. 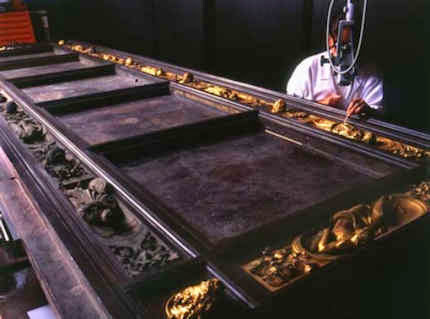 The last treatment (in 1994) was entered into the conservation dossier as “Retouching in face and neck corrected (Bomford) Surface cleaned, revarnished“. No photographic record of this intervention was to be found. 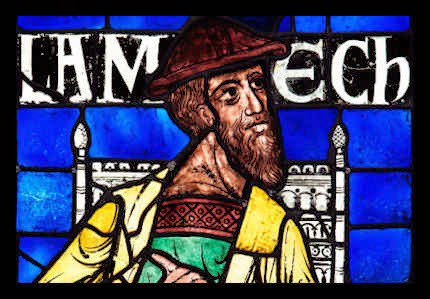 When asked, the restorer, David Bomford, said that this was because: “there were no real changes – it was simply a matter of glazing a few small sections of the previous retouching which had discoloured slightly.” When our colleague, Michel Favre Favre-Felix, of ARIPA, noticed the second repainting in 5 years of the Veronese mouth shown in Fig. 3, and asked to see the Louvre’s documentation on it, he was told there was none because the repainting was but a “localised intervention“. A Louvre spokeswoman later described it as a simple sprucing-up (“bichonnée”) and added triumphantly: “That’s why you cannot find it in the painting’s dossier“. Above, Fig. 1: Detail of Michelangelo’s “Erithraean Sibyl” on the Sistine Chapel celing, before cleaning (left), after cleaning (right). Above, Fig. 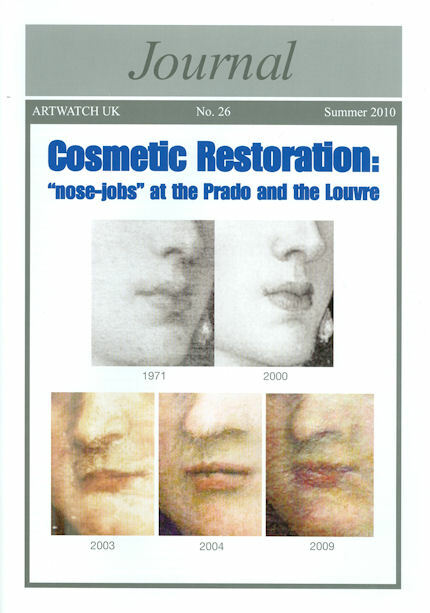 2: Cleanings at the Metropolitan Museum (top) and the National Gallery (bottom), as shown in the programme to the 2001 ArtWatch UK lecture, “Light for Art’s Sake”, by (the late cinematographer) Jack Cardiff. Above, Fig 3: ArtWatch UK coverage of “restoration” changes made to major Titian and Veronese paintings at the Prado and the Louvre. Above, Fig. 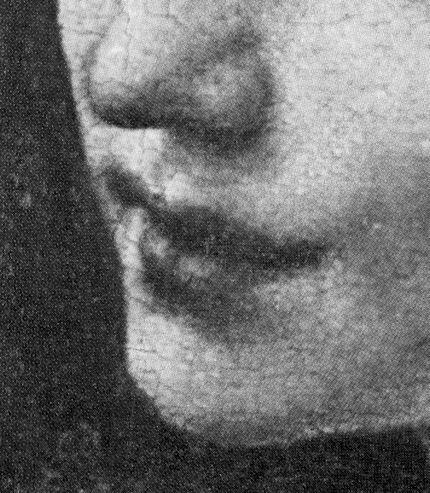 4: Changes made to the mouth and nose tip of the angel in the National Gallery’s “Virgin of the Rocks” in the course of two restorations (see left and below). Above, Fig. 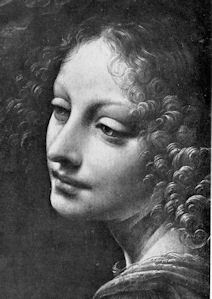 5: The face of the angel in the National Gallery’s version of Leonardo’s “Virgin of the Rocks”, as published in 1938 (before either of its two post-war restorations) in Kenneth Clark’s book “One Hundred Details from Pictures in the National Gallery”. For a comparable detail of the angel in the Louvre’s version of the painting, see Figs. 9 & 10. Above, Fig. 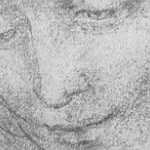 6: The face of the angel in the National Gallery’s “Virgin of the Rocks”, as published (on glossy paper) in the gallery’s 1947 account by Martin Davies of the documentary evidence concerning the picture. That account, and its 16 large plates (see Fig. 19), shortly preceded the restoration of the painting, by Helmut Ruhemann, in 1949. Note how clearly the nose touches the contour of the face. Compare this with the x-ray photograph in Fig. 19 and the nose/contour relationship after Ruhemann’s restoration seen in Figs. 7 & 8. Above, Fig. 7: The face of the National Gallery’s angel, as shown in the gallery’s 1990 re-publishing of Kenneth Clark’s 1938 book of details, with later corresponding colour photographs. Those later photographs, taken together with original 1938 plates, enable the reader to gauge the effects and consequences of many post-war restorations within the gallery. For a discussion of how those results were viewed within the National Gallery itself, see our post of 24 November 2011. Above, Fig. 8: The face of the National Gallery’s angel, as shown in the 2008, second re-publication of Kenneth Clark’s 1938 book of details. For this edition, clearly superior digital photographs were taken at the Gallery. For a discussion of the differences between the two editions, see left. For a discussion of the Gallery’s present, high photographic standards, see Gareth Hawker. Above, Fig. 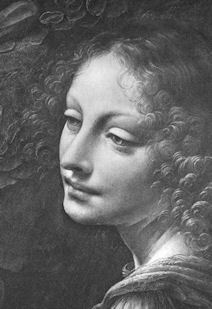 9: The face of the angel in the Louvre’s version of Leonardo’s “Virgin of the Rocks”. Above, Fig. 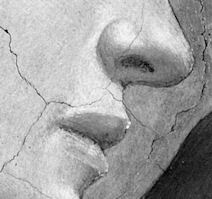 10: A detail of the face of the Louvre angel, showing heavy craquelure. This cracking was almost certainly a consequence of the painting having been transferred, by restorers at the Louvre, from its original panel to a canvas in 1806. The fragilty of its surface may, however, have helped protect the painting from campaigns of cleaning and “restoration”. Above, Fig. 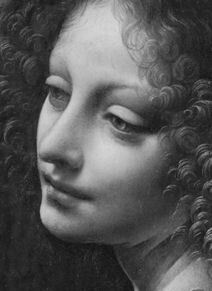 11: Leonardo da Vinci’s c. 1510-15 black chalk study “The Head of St Anne” (reversed) from the Royal Collection, Windsor. Above, Fig. 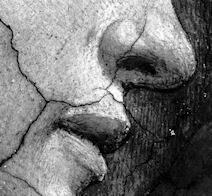 12: Detail (reversed), of Leonardo’s study “The Head of St Anne”. 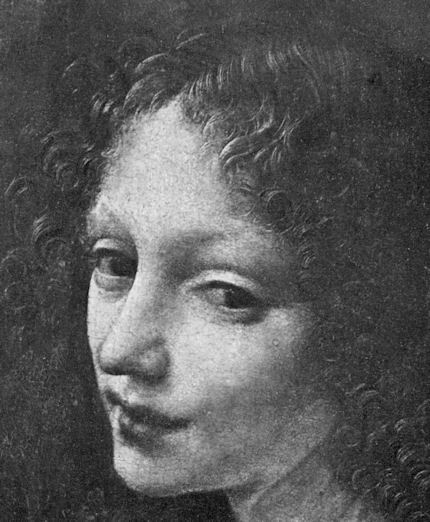 Note the distinctive Leonardo treatment of the (viewer’s) left side of the mouth. 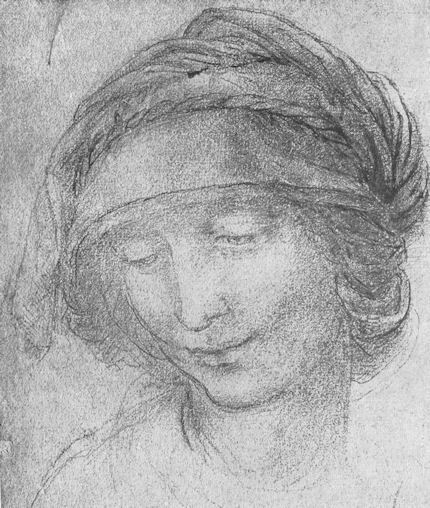 This drawing – a later Leonardo chalk study – was made long after the painting of the Louvre version of the “Virgin of the Rocks” and after the London version. 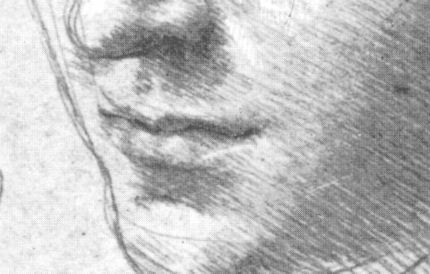 The upwards zig-zagging design of the foreshortened far side of mouth as it tucks into the forms of the cheek, is effectively a life-long Leonardo/Leonardo School trademark signature. It is, for example, also seen below (albeit in slightly less pronounced manner) in a much earlier study that was made before the Louvre painting and, specifically, for it. Above, Fig. 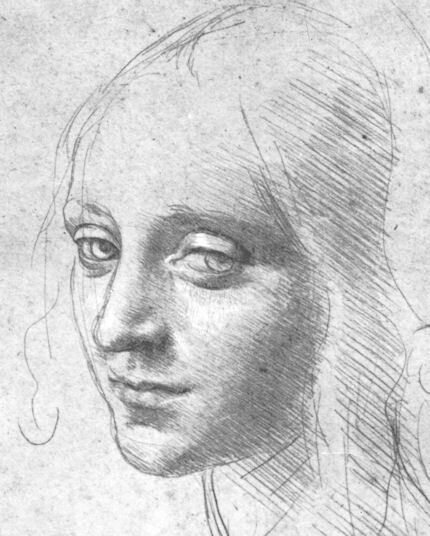 13: Leonardo’s “Study for the Angel’s Head in the Virgin of the Rocks”, the Louvre. This drawing of 1483, in the Turin Royal Library, was made in silverpoint on a light brown prepared paper, for the final painted head seen here at Fig. 9. Above, Fig. 14: A detail of Fig. 13. 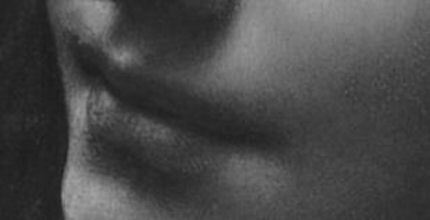 Note the number and the various permutations of lines defining the shape and positioning of the cheek/chin profile contours; the nose; and the mouth. Those variations and explorations might be compared with the final painted version of the face seen in Figs. 9 & 10. Above, Fig. 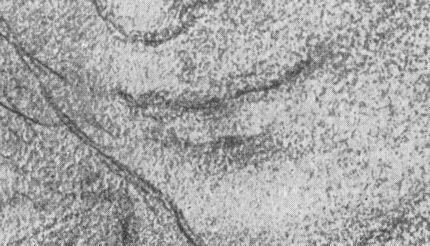 15: A detail of the plate of the National Gallery angel’s head as published by Kenneth Clark in 1938 and showing the then configuration of the mouth. Above, Fig. 16: A detail of the updated 2008 photograph of the National Gallery angel’s head, as shown in the second re-issue of Kenneth Clark’s book of details. This photograph shows the painting after its restoration by Helmut Ruhemann in 1948. Above, Fig. 17: A detail of the the National Gallery angel’s head, as supplied by the Gallery and showing the painting as seen after its latest restoration (which began in 2008) when the picture had been cleaned but before it had been retouched. Above, Fig. 18: A detail of the the National Gallery angel’s head, as supplied by the Gallery and showing the painting as seen after its latest cleaning and after the subsequent retouching. 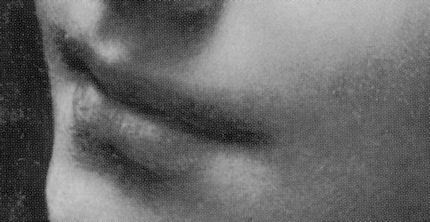 Notice the changes introduced to the far side (on our left) of the mouth, on the upper lip and, particularly, its new relationship to the forms of the cheek. Above, Fig. 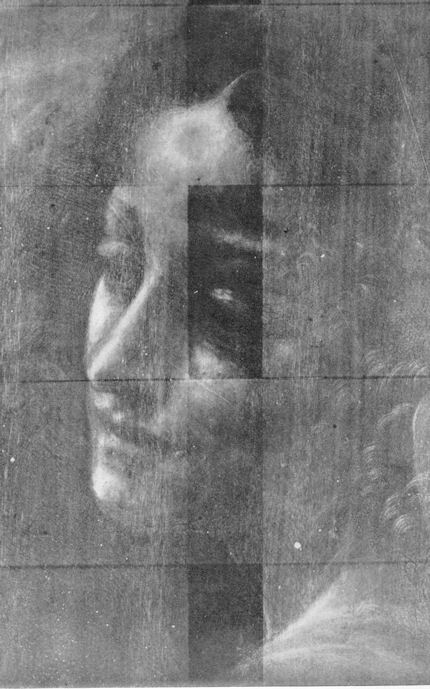 19: An x-ray photograph of the National Gallery angel’s head, as published by the gallery in its 1947 account of the documentary evidence concerning the picture by Martin Davies. (In the current Technical Bulletin there is another, perhaps more recent, x-ray photograph that clearly shows the cradle at the back of the panel. In a second version, the visual “interference” of the cradle has been digitally suppressed.) See Fig. 6 for the appearance of the face before either of the last two restorations and notice here the consistent design of the mouth, as seen right-through all the paint layers, and the clear upward tilt of the far side (to our left) of the mouth.